The terms “NDCW” “NDCWales” “National Dance Company Wales” or “us” or “we” refer to National Dance Company Wales. We are a company limited by guarantee registered in England and Wales under company number 01672419 whose registered office is at The Dance House, Pierhead Street, Cardiff Bay, Cardiff, CF10 4PH. The term “you” refers to the individual accessing and/or submitting Information to the Website. We are committed to protecting and respecting the privacy of your personal information: we want to maintain the trust and confidence of our audiences and supporters as well as our online visitors through our NDCWales website at www.ndcwales.co.uk/en, and any subdomain or any such related website and/or mobile application for such website (the “Website”) and social media pages. We, as the Data Controller, can be contacted via our Data Protection Adviser, Suzanne Carter (Marketing Director) via email data@ndcwales.co.uk or call 02920635600. As Data Controller we are responsible for, and control the processing of, your Personal Data in accordance with applicable Privacy and Data Protection Requirements. “Personal Data” has a legal definition but, in brief, it refers to information relating to an identifiable person who can be directly or indirectly identified in particular by reference to an identifier. Such information must be protected in accordance with applicable Privacy and Data Protection Requirements (this is defined at the end of this Policy). We use Personal Data to ensure that we contact you with relevant information that you want to hear about, such as our performance information at the Dance House, the home to NDCWales, or NDCWales on tour; activities that we run for you to get a deeper engagement with dance; ways to support us and the sector; as well as using information to improve our service and develop the dance sector. Registering your personal details with NDCWales has many benefits, including being able to manage your personal information and the information you receive from us about performances and activities. In certain circumstances (see below), we may ask you to indicate your consent to the way we use your personal information (as is set out in this Policy) when you first submit such personal information to or through our Website, for example, when you opt in to receive information from us at any time on our registration page, as well as updating your preferences. We collect personal information depending on the service we are offering to you; this could be as an audience member; or a participant, or if you deal with us on behalf of your business. We also collect information about people who are visiting our Website or social media pages. We gather Personal Data about you to ensure that we can provide you with a service that meets your needs and to inform you of events or updates you’ve asked for or to contact you if we need to obtain or provide additional information. Provide the best possible audience and customer experience and to help us with internal administration. Fulfil merchandise, donation and membership requests. Process payments. Please note that the Dance House/NDCWales does not store any Credit Card or other payment information once the transaction has been completed. Improve our marketing and communications so the information you receive is relevant to you. We will learn about you, your interests and preferences so we can improve communications in the future. Help us understand our audiences, their motivations and behaviour, we will group audiences into segments, using booking and publicly available information. These segments help us to understand our audience better and ensure we’re sending appropriate communications to you. Measure and review how our audiences respond to a variety of marketing activity to ensure our communications is relevant and effective. Undertake audience research: we may contact you to ask you to participate in audience research online, or telephone survey or in person. You are under no obligation to participate in this research. If you do provide any further information to Dance House/NDCWales we will inform you how the research will be used. Analyse and continually improve the services we offer including our artistic output, our Website and our other products. Analyse how we deliver the artistic programme, website and other marketing outputs so we can improve the service for audiences. Ensure we keep our database accurate and up to date. Contact you with important information relating to your booking or purchase, such as confirming your order, reminding you of an upcoming performance you’ve booked for or letting you know about important information that may affect your visit. Provide you with updates about similar shows and courses that you might be interested in. On the grounds that it enables us to fulfil our service and deliver our contract with you, we process the data because it is necessary for the legitimate interests we pursue as a national dance company. Send you updates via email about our productions; activities on tour and at the Dance House, news or about supporting us. You can update your personal preferences at any point and choose not to hear from us, but this may prevent us from sending you correspondence in future. Please see the previous section for audience members, as we collect the same data that we do for audience members and use it in the same way and on the same grounds. In addition, if you are participating in one of our dance programmes (such as Dance for Parkinson’s, Dance Days, Summer Course, workshops and Dance to Health, for example) we may ask you to provide additional information about your health and wellbeing. We process this data on the legal basis that it is necessary for the performance of the contract between us. By ensuring that we are aware of any requirements you may need during the sessions, this helps us deliver and support your needs and to communicate those to medical professionals in the case of emergency. In accordance with the applicable Privacy and Data Protection Requirements, we will only process this data if you have given your explicit consent for us to process it for this purpose. we will only use this information for the course specified. once you have finished the course, or let us know you are no longer attending, we will destroy this information together with your other information. If you are unsuccessful if getting on the course, your applications and Personal Data will be destroyed. this information is only shared with the teacher / chaperone delivering the session. the health form is only stored in the original hard copy and kept securely until the end of the course. NDCWales will not keep any record of that health and medical form and it will be destroyed. if an accident did happen during a session the Accident Record Form will keep a record of the accident along with the participants name, contact details and accident details. This is then logged as part of the legal procedures of the organisation. Participants under the age of 16 want to take part in one of our dance courses, we will only process that child’s Personal Data for a purpose and legal basis set out above, but also, we will ask the holder of parental responsibility to consent to such processing on behalf of the child. Children and minors have the same rights as adults to know what data we hold, to update their data, object to processing data and the right to be forgotten (among others). Please visit Your Rights section. We have touched on how long we keep certain information already, but we have some further detail about our retention policies here, as the retention period will vary according to the purpose for which your data is processed. 7 years or until consent is withdrawn (whichever is sooner), where the legal basis is express consent. If required, we will be entitled to hold Information for longer periods in order to comply with our legal or regulatory obligations, for example, accident record forms, as discussed previously. join as a Lift member (NDCWales’ supporters membership scheme). In 2007 the Welsh Millennium created a Consortium (defined below) that makes it possible for other arts organisations to benefit from the same ticketing system we use, namely “Tessitura”. We offer a collegiate approach to the use of Tessitura with consortium partners, sharing a system for mutual benefit rather than a more traditional corporate relationship. Whilst all ‘organisation specific’ data is locked down to the appropriate organisation (i.e. transactional information, payment data, customer interactions, ticket history etc. ), there is a general tab on a customer’s record which is shared amongst Consortium partners. This means that by purchasing tickets through Tessitura each consortium member can view the following information: Name, Address, Phone Number, E-mail Address. However, under no circumstance are they allowed to make use of this information unless you have specifically given them permission to do so. If you would like further information on our CRM System, Tessitura and the Consortium please click here. We only collect personal information that’s necessary for us to deliver our service and personal information that you have agreed to provide us to keep you informed. details of any enquiries made by you through the Website, in person, or over the phone together with details relating to subsequent correspondence (if applicable). Your information may be shared with us by other arts organizations such as venues which we have performed at. You are in control of your personal setting on social media. We will only contact you if you wish to receive messages from us depending on your permission to access information from those accounts or services. If you make use of our Website through a social media provider, we may access information about you via that social media provider in accordance with their policies. When using social media and you have chosen to include it in your social media account, we may access information such as your name, profile picture, gender, birthday, email address, town or county and any other information you have chosen to make available. We may also access information from social media providers about your use of an application that we run on their website. We know some of our existing audiences are interested in supporting the company further and we would like to understand who those audience members might be. So long as we have specific consent to do so, we may contact audience members if you have been to see NDCWales at a higher frequency over a 3-year period, or who have been to NDCWales’ fundraising events or supported the company in the past. NDCWales works with a variety of people and organisations to enable it to operate. We work with a variety of artists, freelancers, trustees, different types of organisations and third-party service providers, and sometimes about those who have hired the facilities at the Dance House. As part of our working processes we will need to capture and process sometimes Personal Data if a separate business field is not available, and you have provided us with that information as part of a contract. contact you regarding your contract and business agreement with us. process payments through our finance systems. How we collect this personal information? We collect your personal information if you share this information with us part of a contract or an agreed delivery of service by NDCWales and the Dance House or for our legitimate intrests as a Dance Company. We work with organisations and individuals some of whom provide NDCWales with Personal Data as part of a business agreement such as name, contact telephone number, email, address and bank details. We only collect personal information that’s necessary for us to deliver our service. If business fields are not provided, Personal Data may include name, address, email, telephone number and bank account details. You can update your personal preferences or let us know at any point if you choose not to hear from us, but this may mean you will not receive necessary correspondence from us that allows us to perform the contract with you. Ensure that NDCWales can provide communication and service to those using the company, such as tour venues, schools or the Dance House facilities. Detect and reduce fraud and credit risk we will retain data with a financial connection for up to 7 years. Any Personal Data held by National Dance Company Wales and the Dance House will not be shared with any third party without your consent for marketing purposes. Sage International - Tracking all payments to staff, freelancers and organisations through Sage. PayPal/ eBay to pay for good or a service directly. Third party organisations which supply a marketing support service such as box office system Tessitura, freelancers, mailing houses, website hosting providers or email delivery service. Audience Insight and the Audience Agency who help us analyse audience behaviour to improve our service to you. All third-party service providers have gone through a Third-Party Assessment by National Dance Company Wales to ensure it meets the Data Protection Guidelines Regulations. National Dance Company Wales and the Dance House takes managing Personal Data seriously and has adopted robust and appropriate technologies and policies, so the information we have about you is protected. All information you provide to us is stored on our secure servers. Any payment transactions will be encrypted. You would have created a password if you purchased tickets through Wales Millennium Centre website and you are responsible for keeping this password confidential. We ask you not to share a password with anyone. Where you are dealing with us on behalf of a limited company or LLP, for business purposes, then we may contact you by email to your corporate email address about similar or related products that we offer. If you prefer not to receive any direct marketing communications from us, or you no longer wish to receive them, you can opt out at any time. Where you have previously ordered products or services from us we may contact you by telephone and email and post about similar or related products, services, promotions and special offers that may be of interest to you. We will inform you (during the sale process) if we intend to use your data for such purposes and give you the opportunity to opt-out of receiving such information from us. In addition, and if you have given permission, we may also contact you by telephone and email about our other products, services, promotions and special offers that may be of interest to you. We will inform you (before collecting your data) and seek your permission if we intend to use your data for such additional marketing purposes. If you prefer not to receive any direct marketing communications from us, or you no longer wish to receive them, you can opt out at any time. If you have given permission, we may contact you by mail, telephone and email to provide information about products, services, promotions, special offers and other information we think may be of interest to you. We will inform you (before collecting your data) if we intend to use your data for such purposes. If you would rather not receive such marketing information from us, or you no longer wish to receive it, you can opt out at any time. If you have given permission, we may share your Personal Data with carefully selected third party organisations and business partners and they may contact you directly (unless you have asked them not to do so) by mail, telephone and email about products, services, promotions and special offers that may be of interest to you. We will inform you (before collecting your data) and seek your permission if we intend to disclose your data to third parties for such purposes. If you prefer not to receive direct marketing communications from our business partners, or you no longer wish to receive them, you can opt out at any time (see below). You have the right at any time to ask us, or any third party, to stop processing your information for direct marketing purposes. If you wish to exercise this right, you should contact us by sending an email to data@ndcwales.co.uk contact the relevant third party using their given contact details, giving us or them enough information to identify you and deal with your request. Alternatively, you can follow the unsubscribe instructions in emails you receive from us or them. Request access to information about Personal Data that we may hold and/or process about you, including: whether we are holding and/or processing your Personal Data; the extent of the Personal Data we are holding; and the purposes and extent of the processing. Have any inaccurate information we hold about you be corrected and/or updated. If any of the Information that you have provided changes, or if you become aware of any inaccuracies in such Information, please let us know in writing giving us enough information deal with the change or correction. In certain circumstances to request that we delete all Personal Data we hold about you (the ‘right of erasure’). Please note that this right of erasure is not available in all circumstances, for example where we need to retain the Personal Data for legal compliance purposes. If this is the case, we will let you know. In certain circumstances to request that we restrict the processing of your Personal Data, for example where the Personal Data is inaccurate or where you have objected to the processing. To request a copy of the Personal Data we hold about you and to have it provided in a structured format suitable for you to be able to transfer it to a different data controller (the ‘right to data portability’). Please note that the right to data portability is only available in some circumstances, for example where the processing is carried out by automated means. If you request the right to data portability and it is not available to you, we will let you know. In certain circumstances to object to the processing of your Personal Data. If so, we shall stop processing your Personal Data unless we can demonstrate sufficient and compelling legitimate grounds for continuing the processing which override your own interests. If, because of your circumstances, you do not have the right to object to such processing then we will let you know. In in certain circumstances not to be subject to a decision based solely on automated processing, for example where a computer algorithm (rather than a person) makes decisions which affect your contractual rights. Please note that this right is not available in all circumstances. If you request this right and it is not available to you, we will let you know. To object to direct marketing, for which see above. We may collect information about your computer, including where available your IP address, operating system and browser type, for system administration and to help us monitor our engagement and delivery to you. An IP address is a unique number which allows a computer, group of computers or another internet connected device to browse the internet. The log file records the time and date of your visit, the pages that were requested, the referring website (if provided) and your internet browser version. Using Google Analytics, we use this information to help understand audiences online; where they are from; what pages they are most interested in; how did they find out the information and how we could improve our engagement. This is statistical data about our users' browsing actions and does not identify any individual. We monitor and record images using closed circuit television at our home the Dance House and at the Wales Millennium Centre box office. We do this for the purposes of crime prevention and public safety. This policy was updated on 12 June 2018 in line with the new General Data Protection Regulations. A cookie is an online file which is stored on your internet browser or the hard drive of your computer. Cookies contain information that is transferred to your computer's hard drive from our website. A cookie allows us to monitor and deliver a better more personalised online service. Some of the cookies we use are essential for the site to operate. A cookie cannot give NDCWales access to your computer or to information beyond what you provide us. 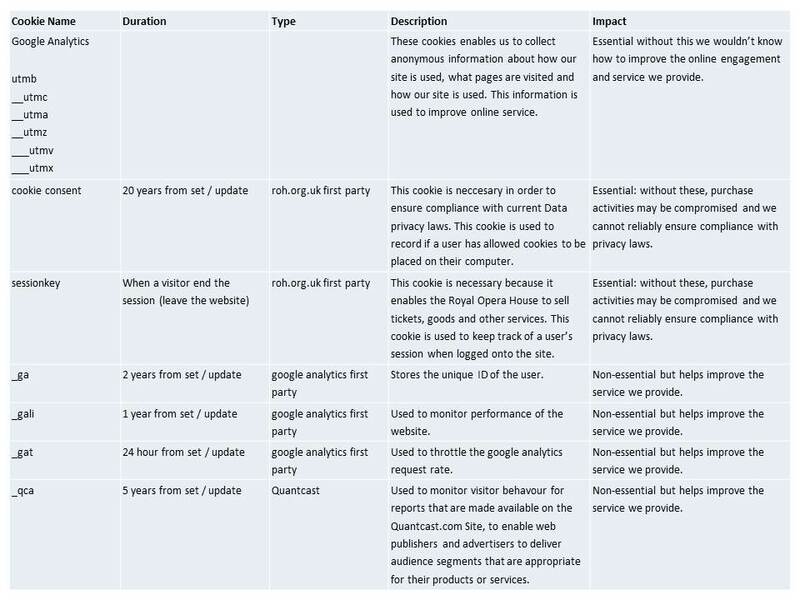 The following table sets out which cookies NDCWales uses, their purpose and how intrusive they may be considered. We sometimes use online cookies for targeted online advertising based on audiences who have visited our website, social media channel pages or have determined their interests and demographic through Google. Google uses the third-party DoubleClick cookie to collect data and serve ads that are relevant to you on the websites of its partners. The cookie does not contain any personally-identifiable information and we do not merge it with any personally-identifiable information collected through the website. 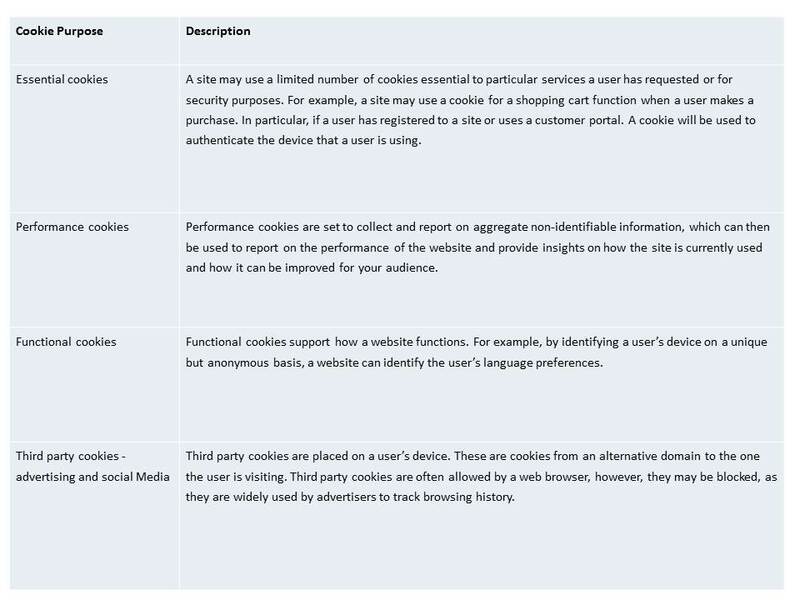 Users may opt out of the use of the DoubleClick cookie for interest-based advertising by visiting Ads Settings. The features used are: Remarketing with Google Analytics, Google Display Network Impression Reporting and Google Analytics Demographics and Interest Reporting. Cookies can not identify you and we can not see any Personal Data on your computer. 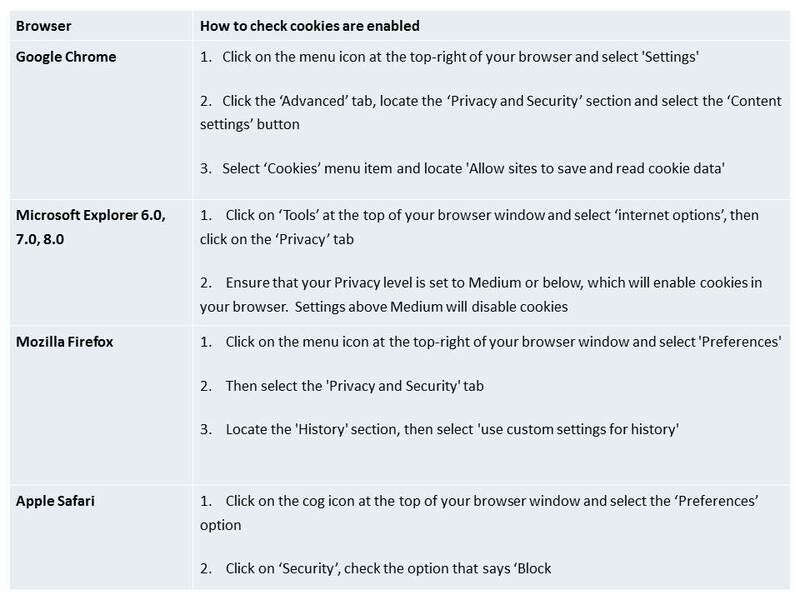 However, if you wish to change your setting and disable cookies you can do through your browser settings. By changing your setting this will affect your personal preferences to the website.